The recent NRL Grand Finals, the Paralympics and the Olympics have had me thinking a lot about “teamwork” and how it also applies to martial arts, which may seem to some to be a largely solitary personal pursuit. the fairy tale Cronulla Sharks, denied a Premiership for so long, holding the dreams of large swathe of Sydney. I must admit (as an objective Novocastrian) that I was glad for the Sharkies fans to have a success to celebrate after so many years in the wilderness! These teams can be both positive influences and, unfortunately, occasionally negative role models. However we can all learn from their commitment to training, working together and turning up week in and week out to have a go. Some of these are team participants and others are individuals – but even individual sportspeople have a team behind them to help them pursue their goals! And of course the Olympics had its stars and teams as well, and Darren and I recently discussed these in a recent blog on what the Olympics have taught us – here. To some martial arts may seem like a largely singular and personal pursuit, however at Quantum and as part of the broader Northstar Ju Jitsu network, we embrace a spirit of community and service that means our training is a team experience. Our Senior Instructor MLP always refers to the group as “Team” and personally it embodies for me the synergy of what we can achieve together. I have observed the life changing benefits of what the Quantum Martial Arts community and the broader Northstar Ju Jitsu network offer to our students – transformations of mind, body and spirit. We rise as a group and the service that we offer to each other in our approach is fundamental to the Quantum community – both children and adults. The students are introduced to the concept of service as they progress through the belts. We partner with other students in the class and groups do extra practice outside of normal hours. 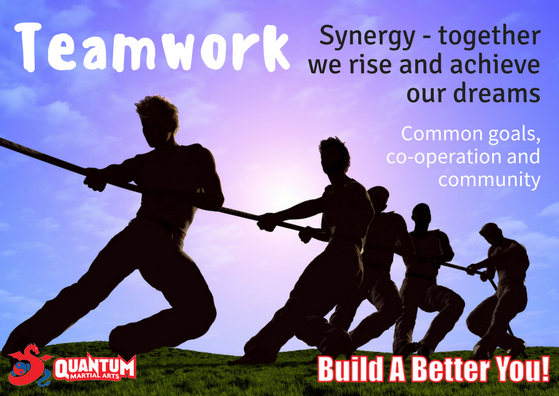 Anyone who has achieved a Black Belt will attest to the teamwork that underpins that milestone in their life – not to mention the support of partners, family and friends they will have received as they challenged themselves with that aspiration. The majority of the adult trainers and assistant trainers who take a leadership role in our community provide their time, skills and assistance out of service and commitment to the team. So this week at training recognise the importance of our training partners, the community and volunteer trainers!